How to Protect Your Skin as You Play Holi! It is important that we extra care to protect our skin and hair in this festive season of Holi. Holi is a festival of colors and unity. 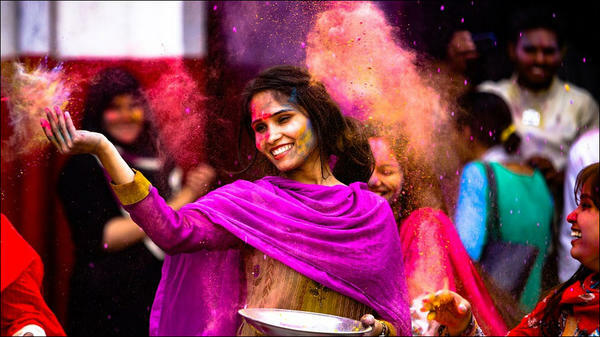 Initially the colors used in Holi celebrations were made of natural, plant-based sources such as Turmeric, Rose and Henna. However, in today’s time, chemically charged colors are used. Such colors are harmful for the skin and for overall health as well. >Smudge organic oil: Choose any oil available at home (coconut, almond, olive) and put it all over the body and hair to form a shielding coating. Oil is placatory, plus water repellent, which will make your skin ready to brave water colors. >Use a sunscreen and body cream: Since you will be out all day playing with colors and dancing, it’s a astute idea to protect skin and hair from sun damage by applying sunscreen and hair oil to your body and hair. >Cover the hair and skin: Tress your hair to avert rupture and if you can go an extra mile, just wrap a scarf around head. It will make you look chic and act as a cover for the hair. Wear full-sleeved, synthetic clothes to prevent extra water retention. >Lip fence: Don’t overlook your lips. Apply lip balm that contains SPF, which will guard your lips from sun damage and color damage. So, keep the above tips in mind while going out to play Holi. Happy HOLI – The Festival of Colors! Happy Holi... Handling The Aftermath!